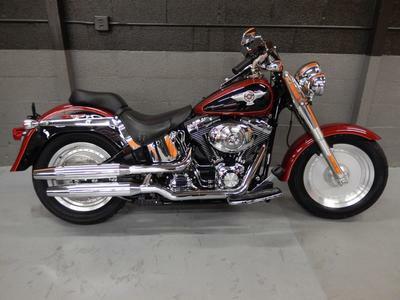 The 2006 Harley Fatboy for sale is a very clean 2006 HARLEY-DAVIDSON FLSTFI FAT BOY that features an eye-catching two-tone paint color combination of Fire Red Pearl and Vivid Black. This fine motorcycle has just 7K original miles on her currently; she is really, beautiful. I have her priced to make a fast sale. I would like to mention that there is a little of the paint job's clear coat coming off on the front forks. The 2006 Harley Fatboy for sale is located in Pompano Beach FL Florida and as I mentioned; she's priced to SELL! For more information and pictures of this good-looking Harley for sale send me an email paul.barrsorm55 "at" juno "dot"com and don't forget to mention that you found this ad on GoGoCycle's Used Motorcycles for Sale www.gogocycles.com in your message.